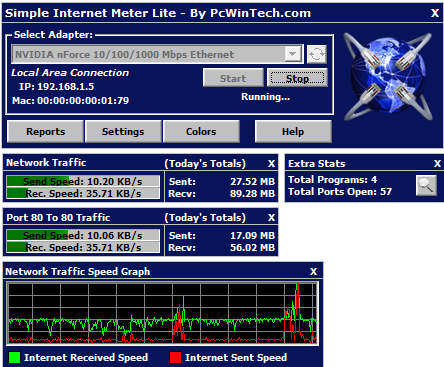 About Simple Internet Meter Lite. More info on PacketX and WinPcap can be found here. As many of the users know from my other work I am a performance nut. I try to have my programs run fast and clean all the while taking as little out of the system as possible. I put extra effort into Simple Internet Meter to make sure it does its job without affecting the system in anyway. The program will auto clean its used memory any time the memory usage goes above 10 mb. The program is designed to run 24/7. A great feature I included was the ability for other programs to read the current data from the program. Such as a screen saver. I wrote a screen saver and is included with the program. I included the source code for the screen saver (VB 6) so other programmers can see how to work with Simple Internet Meter. The reason I added this was so other programmers can make their own programs read from it. You may ask besides a screen saver what other program would need this info? Well some new keyboards are coming out with LCD screens and such so one good example is a program to display the stats to that LCD screen. If you have written a program to work with Simple Internet Meter please contact me and let me know, I will be more than happy to post a link as along as the program is safe to use.